The book of Deuteronomy, which most people skip and the rest of us skim, does contain interesting passages for us to consider. In one short section, God addresses capital punishment. Though the idea of executing people for their offenses may offend our sensibilities, don’t dismiss this passage. Learn from its words. It gives insight into Jesus’s gift of the ultimate sacrifice. This passage in Deuteronomy talks about executing criminals on a pole. It commands people not to leave the body hang overnight but to bury it the same day. Further it goes on to state that anyone hung on a pole is under God’s curse. We don’t know the exact configuration of the cross Jesus died on, but we can understand that in simple terms, it was a pole. Jesus died on a pole, and his body hung exposed on a pole, exactly aligned with this passage in Deuteronomy. There he suffered and served as our sacrifice. It’s hard for us to think of Jesus being under God’s curse, yet as he died on the cross, suffering the consequences for what we’ve done wrong, he was under God’s curse. He suffered God’s punishment for our wrongdoing. Paul confirms this in his letter to the Galatian church. He tells them, and reminds us, that when Jesus became our curse, he freed us from the curse that we deserve (Galatians 3:13). 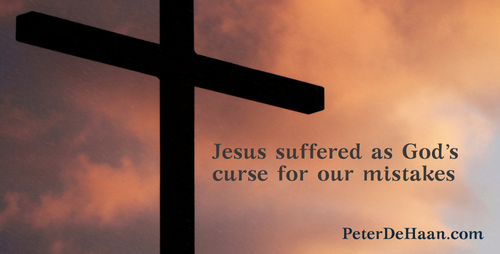 Jesus died under God’s curse to free us from the curse.